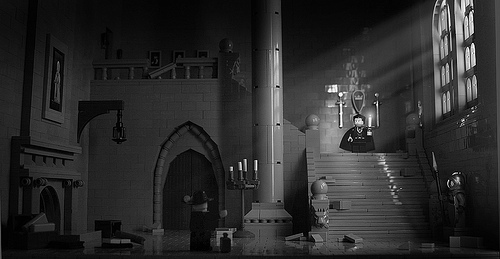 Mark Kelso (Amhakia) shares with us his vision of Dracula’s castle inspired by the classic black and white horror films. One of the standout features of this shot has got to be the visible rays of light piercing through the window. The interior is disheveled without being messy. Just incredible photo that all I can say. The lights from window are great. Is this based on the actual set of the Bela Lugosi film? Coincidentally, it’s Lugosi’s birthday today. The lighting in this piece is what makes it stand out to me. The doorway is also a nice shape.